Dining out is a fun social activity and a great way to enjoy some of your favorite foods and try new food as well. While it’s convenient and enjoyable, it can be quite expensive depending on where you go and how often you go out to eat. If you’re on a budget and have other intentions for your money, you might want to cut your dining out expenses, especially if it isn’t helping your bottom line. Dining out can be one of the hardest things to cut back on since it can be a daily temptation. Here are a few effective strategies to help you dine out less and spend less money when you do go out to eat. Too many times, we buy food that we feel mediocre about in the grocery store. When the opportunity comes to dine out, we might take it in the hopes of getting to eat some tasty food that is ‘better’ than what’s in our fridge. To avoid this, I encourage you to develop a giant list of all the foods you love and find yourself excited to eat. Then, work those food items into your grocery budget along with other foods that you need that are healthy for you. For example, I love fresh salmon, ground turkey because I can make tacos with it, and chicken wings because they are so versatile and you can cook them in so many ways with different seasonings. I also like certain vegetables that I know my family is going to eat like cauliflower, broccoli, kale, etc. These types of foods always make it onto my grocery list because my family is excited to eat them each week. Dining out is less of a temptation when we can easily prepare a fresh and delicious meal that is far from mediocre. If you like to dine out for the excitement of trying new or unusual food, try cooking that type of food at home instead. There are tons of free recipe websites and even video apps nowadays like Yummly, Tasty, and more that show you quick and mouthwatering recipes that you otherwise might not have thought to try. Deep down, no one wants to eat the same food all the time, even if they really like it. Ordering food at a restaurant can be exciting because when you look at the menu, you see that you have tons of options. You can recreate this at home by cooking your own meals as well. My family loves variety, so exploring new recipes is something we do often. Dining out and ordering takeout will always seem convenient because you’re letting someone else do all the meal prep and cooking. If you are tired of paying the price for this convenience, make an effort to prep your own food at home and plan out your meals. When you go grocery shopping, organize your list by which meals you want to make. Next to every item on my list that I think will create a meal, I put an ‘M’. If I think there will be leftovers for the next day, I put another ‘M’ next to it and it lets me know how many meals I purchase at the store. You can use this technique, then write down the specific meal for each day on a calendar or white board near your kitchen. Schedule to have the meals that are easier to cook on the days that are busiest for you. You can also prep or even cook extra food on weekends or the night before, then freeze it until you are ready to warm it up and eat it. Another thing you can do is embrace crock pot cooking. Investing in a slow cooker can really add convenience to your food prep. Slow cookers do all the work in terms of preparing your food so you can do other things. It’s unrealistic to think that you’ll never dine out again, even if you take advantage of all these strategies. While you can definitely reduce the amount of times you dine out, if you really want to control it, you may want to cut the expense completely out of your budget. Since going out to eat isn’t a necessity, you don’t have to pay for it with your main source of income. Consider joining a loyalty rewards program to earn enough money to dine out every once in awhile. Swagbucks is one of my favorite tools to use because you can earn points or ‘swagbacks’ by trying out different offers, making purchases, watching videos, taking surveys, and even just searching online. Once you obtain a certain amount of swagbucks, you can redeem them for gift cards to popular retailers or restaurants. I believe 2,500 swagbucks earns you a $25 gift card. If you use Swagbucks each week, you can earn enough points to obtain gift cards to some of your favorite restaurants. If you use loyalty rewards programs solely for having funds to dine out, it can limit how often you dine out since you’ll have to wait until you have enough rewards to cash in. How often do you dine out? 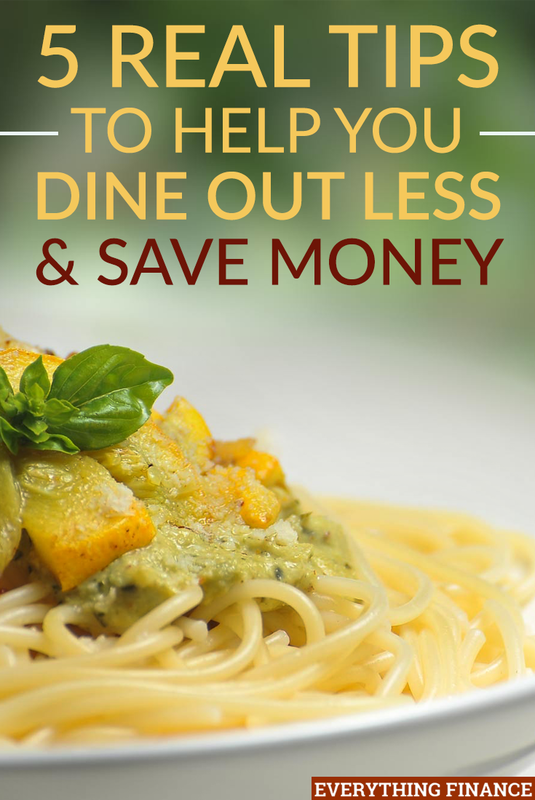 Have you tried any of these tips and strategies to save money on restaurant food or reduce the amount of times you dine out? Can You Afford to Be a Stay At Home Parent? Is Your Workout Worth the Cost? Are You Still Working Without a Budget?